The fornix (meaning "arch" in Latin) is a C-shaped bundle of nerve fibers in the brain that acts as the major output tract of the hippocampus. The fornix also carries some afferent fibres to the hippocampus from structures in the diencephalon and basal forebrain. The fornix is part of the limbic system. While its exact function and importance in the physiology of the brain are still not entirely clear, it has been demonstrated in humans that surgical transection – the cutting of the fornix along its body – can cause memory loss. There is some debate over what type of memory is affected by this damage, but it has been found to most closely correlate with recall memory rather than recognition memory. This means that damage to the fornix can cause difficulty in recalling long-term information such as details of past events, but it has little effect on the ability to recognize objects or familiar situations. The fibers begin in the hippocampus on each side of the brain as fimbriae; the separate left and right sides are each called the crus of the fornix (plural crura). The bundles of fibers come together in the midline of the brain, forming the body of the fornix. The lower edge of the septum pellucidum (the membrane that separates the lateral ventricles) is attached to the upper face of the fornix body. The posterior fibers (called the postcommissural fornix) of each side continue through the hypothalamus to the mammillary bodies; then to the anterior nuclei of thalamus, which project to the cingulate cortex. The anterior fibers (precommissural fornix) end at the septal nuclei and nucleus accumbens of each half of the brain. The lateral portions of the body of the fornix are joined by a thin triangular lamina, named the psalterium (lyra). This lamina contains some commissural fibers that connect the two hippocampi across the middle line and constitute the commissure of fornix (also called the hippocampal commissure). The terminal lamina creates the commissure plate. This structure gives existence to the corpus callosum, the septum pellucidum, and the fornix. The fornix splits into two columns at the front (anterior pillars), and then splits into two posterior crura. These two crura are joined together through the hippocampal commissure. The beginning of the splitting is called the psalterium or Lyra Davidis. The latter name is used because the structure resembles a lyra (or triangular harp): The two crura are the "chassis" of the lyra, and the commissure connections are the fibers. 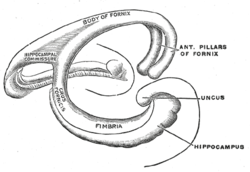 The columns (anterior pillars; fornicolumns) of the fornix arch downward in front of the interventricular foramina and behind the anterior commissure, and each descends through the grey matter in the lateral wall of the third ventricle to the base of the brain, where it ends in the mammillary bodies. The crura (posterior pillars) of the fornix are prolonged backward from the body. They are flattened bands, and, at their commencement, are intimately connected with the under surface of the corpus callosum. Diverging from one another, each curves around the posterior end of the thalamus, and passes downward and forward into the temporal horn of lateral ventricle. Wikimedia Commons has media related to Fornix of the brain.